A year ago, Social Sciences Dean Katharyne Mitchell was a professor of geography, happily ensconced at the University of Washington, her intellectual home since 1993. And then Donald Trump was elected president of the United States. "I was spurred to leadership by the election," said Mitchell. "I was feeling like a lot of what I value and cherish—what I love about this country, and what I love about the Earth—suddenly seemed much more fragile." 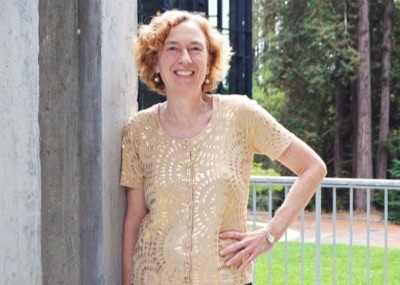 When a colleague alerted her that the dean of the Division of Social Sciences at UC Santa Cruz was retiring, Mitchell was intrigued. A native of Boston, Mitchell earned her Ph.D. from UC Berkeley and had long considered this campus to be a beacon of innovative, interdisciplinary scholarship—a campus steeped in progressive values that offered a dynamic educational experience to students. "I was feeling some despair about the future and what I could do when a colleague sent me the job description," said Mitchell. "I realized I was in a place in my career and in my life where I could take a leadership voice, contesting the things I saw coming down the pike on the national front." Two months into her new job, Mitchell has brought energy, focus, and vision to the division. "I want to use the resources of the university to provide faculty with what they need for their research and students with their education so that we can all work together to mitigate the harmful effects of what's going on at the national level," she said during a recent interview. Already, Mitchell is reaching out to the other academic divisions on campus—arts, humanities, physical and biological sciences, and engineering—because she believes social scientists have contributions to make across the disciplines. "Social scientists ask the probing questions about access, power, justice, and equity," she said. "Engineers make robots, but social scientists study how humans interact with robots. Scientists tell us water levels will rise with climate change, but social scientists are the ones who look at who will be affected, they look at the fairness of mitigations, how changes will impact schools and food distribution. That's our world. Any project should have a social science component." An urban geographer who swims several times a week for exercise (and plans to take up surfing), Mitchell studies migration, refugee and asylum policy, citizenship, and education and democracy; her faculty appointment is in the Sociology Department. Mitchell is an unapologetic champion of higher education, with a particular fondness for public universities. Faculty contribute "real research, real facts," and universities model the "importance of inquiry, civility, dialogue, and engaging across difference." "We do that!" she said. "That's what happens at a university. We have to take that show on the road." Mitchell's message for faculty is to keep doing high-caliber research, keep producing knowledge, and keep nurturing the critical-thinking skills of the next generation. "It's the young people who keep us from getting cynical and despairing," said Mitchell. "It's always important to critique the system, but teaching is not just about deconstruction. Doom and gloom isn't helpful. We have to give students avenues, aspirations, visions of what they can do. We have to let their imaginations soar." Alumni have to step up, too, she said: "They need to value us and the fabulous education they got at this public university. They need to be loud and clear about the value of what they learned." Mitchell, who credits great staff with allowing her to "hit the ground running," said her top priority this year is to launch a social sciences research institute to raise the profile of the division. Led by a faculty director and a staff assistant director, the institute will provide financial support to faculty and students, host events, and share research results broadly with academic and non-academic audiences. An executive board made up of faculty will govern the institute, which Mitchell hopes will be fielding proposals by Spring Quarter. "The social sciences are the core of the campus," Mitchell told the audience during the division's recent annual fall breakfast, when she announced the institute. "We are the lifeblood that connects and sustains this place. We will develop strategic themes over time. Our social justice mandate is our heritage and our comparative advantage."